Best Pressure Cookers Rated - Don't Buy Until You Read This! 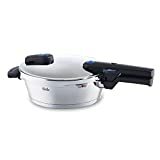 This Fissler Pressure Cooker is ranked #1 by America’s test Kitchen and other pressure cooker reviews and it is my favorite as well. Read my full Fissler Pressure Cookers review here. High quality stainless steel, completely dishwasher safe (even the handle), an easy to read pressure indicator, and a broad design that is good for browning foods. The heating disk on the bottom extends to the edges to avoid scorching food and provides excellent even heat distribution. 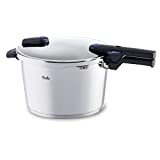 In testing, the Fissler Pressure Cooker achieved the claimed pressure of 15psi and 250 degrees, ensuring that food will cook properly in the times given in recipes. 8.5 Quart is the best size for most kitchens. The 6.3 Quart is very popular, but you’ll find it too small for some recipes. Go for this one instead at a great price (significantly less expensive in Amazon’s competitive marketplace.) 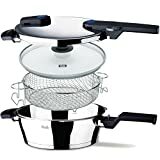 For other sizes and hot deals on other Fissler Pressure Cookers, scroll down the page. GREAT DEAL on the Fissler Vitaquick Pressure Cooker - 8.5 qt. Amazon Price: $219.10 (as of April 26, 2019 10:13 am - Details) Product prices and availability are accurate as of the date/time indicated and are subject to change. Any price and availability information displayed on the Amazon site at the time of purchase will apply to the purchase of this product. This is the Winner -- Best Overall Pressure Cooker. 8.5 Quart is the right size for most home users. Obviously a great discount at this price. This is the stainless steel pressure cooker that I decided to buy myself. It performs almost as well as the Fissler Vitaquick, but at a much lower price point (at the links I have provided). 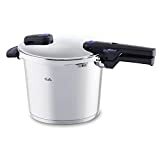 It is not quite as sturdy/heavy/high-quality feeling as the Fissler pressure cooker, and the handle is not dishwasher safe although the other components are. Otherwise, top notch performance from the Fagor Pressure Cooker- even heating, good for browning, easy to see pressure indicator, non-scorching design – (read the full Fagor Pressure Cookers review here). The links go to the best deal on this I’ve found (again, big savings at Amazon over other retailers including free shipping.) For other sizes, although the 8 quart is the best size for most buyers, scroll down the page for hot deals on other Fagor Pressure Cookers. 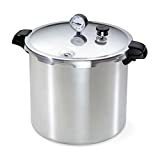 The Presto Pressure Cookers are consistently among the top sellers on Amazon and this is very cheap for a stainless steel pressure cooker. However, keep in mind that you get what you pay for in stove top pressure cookers and the made-in-China Presto feels a bit flimsy. While the Fissler and Fagor models have both “high” and “low” settings, the Presto only has one (high) setting. Grains and some delicate foods such as certain vegetables and fish are usually cooked at the low setting, limiting the usefulness of this unit. The pressure indicator is recessed, making it more difficult to see from across the kitchen. Still, it has a good shape for browning and performs well enough. 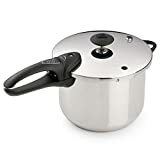 While I strongly recommend the Fissler pressure cooker or the Fagor (think about owning it for 10+ years) the Presto 8 Quart Pressure Cooker is an undeniable bargain for those on a tight budget. Scroll down the page to see hot deals on other popular Presto Pressure Cookers. Amazon Price: $119.00 $59.73 You save: $59.27 (50%) (as of April 26, 2019 10:14 am - Details) Product prices and availability are accurate as of the date/time indicated and are subject to change. Any price and availability information displayed on the Amazon site at the time of purchase will apply to the purchase of this product. WINNER -- BEST PRESSURE COOKERS - Budget. Very low price and not as featured as the Fissler and the Fagor but a nice deal at this price! What makes these the best pressure cookers? This is what to look for. 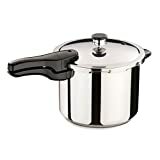 Aluminum pressure cookers give a metallic taste to high-acid foods such as tomatoes, which is why you won’t see too many topping reputable pressure cooker reviews even though they sell well. While they are cheap to produce and light weight, we cannot recommend an all-aluminum pressure cooker. Stainless steel is the material of choice for easy cleaning, no metallic taste, durability, induction compatibility etc. etc. Always choose a stainless steel pressure cooker over aluminum. All of our best pressure cookers are stainless steel. There are a couple of different factors to take into account when determining heating performance. All of our stainless steel pressure cookers have a heating disk integrated into the base. This disk is made of aluminum, surrounded by stainless steel. A thicker disk is better as it holds heat for longer. This is important because after the pressure cooker is heated up, you reduce the heat. If the disk is too thin, there is too much heat loss and you will have to keep increasing and decreasing the heat to maintain pressure. All of our picks have good, thick heating plates. You must also consider that pressure cooker recipes assume that the cooker will achieve 15psi of pressure which equates to a steam cooking temperature of 250 degrees Fahrenheit at the high setting. If the pressure cooker misses the mark, your food will not be done in the time the recipe calld for and you will have to re-seal the cooker and heat it up again, losing precious time. Our picks performed well enough in this regard — The Fissler pressure cooker came out on top with the Fagor pressure cooker close behind. Other, even expensive, pressure cookers do not perform as well. It’s Important to note that Stove Top Pressure Cookers are superior in almost every way to electric pressure cookers and, frankly, should be your preferred choice. Since you will often brown meat in the bottom of the pressure cooker prior to adding liquid and sealing it up, you want even heat distribution which all of our pressure cookers achieved but you also need a wide surface to fit as much food in as possible and a low height so that you can see into the pot and stir food around easily. Pressure Cookers with bulging sides that are wider than the heating disk will scorch food in the corners and should be avoided. All of our best pressure cooker picks have straight sides to avoid this pitfall. The Pressure gauge should be easy to read and the Fissler Pressure Cooker and the Fagor Pressure Cooker excel in this regard. The Presto pressure cooker is not as easy to read but, hey, it’s super cheap. The pressure cookers should be easy to lock and use and all of our cookers are just fine, with the Fissler the best. Always look for a well-made pressure cooker from a reputable company. 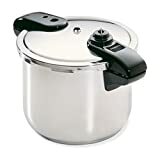 In pressure cooker reviews, the Fissler pressure cooker is singled out as the best made, but even the Presto pressure cooker is OK considering the low price. Most home users will be most satisfied with 8 quart pressure cookers and will find 6 quart pressure cookers and smaller too small for some recipes and more difficult to brown food in. 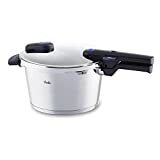 Choose the 8 quart, but if you still want a smaller one, here are some super deals on popular models of Fissler Pressure cookers, Fagor Pressure Cookers, and Presto Pressure Cookers (including our winning “best pressure cooker” models). The quality will be similar to our winners but the sizes and configurations will be different and are worth checking out. Amazon Price: $199.95 (as of April 26, 2019 10:13 am - Details) Product prices and availability are accurate as of the date/time indicated and are subject to change. Any price and availability information displayed on the Amazon site at the time of purchase will apply to the purchase of this product. Same great quality as the 8.5 Quart but make sure it's big enough for you. Not as much space to brown items. Some recipes will call for the larger size. Fissler Vitaquick Pressure Cooker - 4.8 qt. Amazon Price: $179.94 $179.90 You save: $0.04 (as of April 26, 2019 10:13 am - Details) Product prices and availability are accurate as of the date/time indicated and are subject to change. Any price and availability information displayed on the Amazon site at the time of purchase will apply to the purchase of this product. Fissler Vitaquick Pressure Pan - 4.2 qt. Amazon Price: $219.95 (as of April 26, 2019 10:13 am - Details) Product prices and availability are accurate as of the date/time indicated and are subject to change. Any price and availability information displayed on the Amazon site at the time of purchase will apply to the purchase of this product. Looking for the 4.2 quart Vitaquick Pressure Pan/ Vitaquick Pressure Skillet? This is the best deal we found - huge discount available right now. Amazon Price: $141.00 (as of April 26, 2019 10:13 am - Details) Product prices and availability are accurate as of the date/time indicated and are subject to change. Any price and availability information displayed on the Amazon site at the time of purchase will apply to the purchase of this product. Looking for the smaller 2.6 quart Vitaquick Pressure Pan/ Vitaquick Pressure Skillet? This is the best deal we found. Amazon Price: $349.95 (as of April 26, 2019 10:13 am - Details) Product prices and availability are accurate as of the date/time indicated and are subject to change. Any price and availability information displayed on the Amazon site at the time of purchase will apply to the purchase of this product. Amazon Price: N/A (as of April 26, 2019 4:23 am - Details) Product prices and availability are accurate as of the date/time indicated and are subject to change. Any price and availability information displayed on the Amazon site at the time of purchase will apply to the purchase of this product. This Fagor 5-pc. 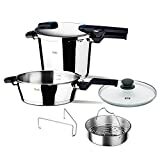 Duo Pressure Cooker Combination includes the 8 quart and 4 quart pressure cookers, a shared pressure cooker lid and tempered glass lid that fits both cookers; and a pasta/steamer basket. Recipe book included. Nice Deal on a Combo! Amazon Price: $59.99 $39.24 You save: $20.75 (35%) (as of April 26, 2019 10:14 am - Details) Product prices and availability are accurate as of the date/time indicated and are subject to change. Any price and availability information displayed on the Amazon site at the time of purchase will apply to the purchase of this product. A great deal on this very popular, but smaller, Presto Pressure Cooker. Amazon Price: $84.99 $37.43 You save: $47.56 (56%) (as of April 26, 2019 10:14 am - Details) Product prices and availability are accurate as of the date/time indicated and are subject to change. Any price and availability information displayed on the Amazon site at the time of purchase will apply to the purchase of this product. Cooks healthy, flavorful meals 3 to 10 times faster than ordinary methods. Long-lasting stainless steel with tri-clad base provides fast, even heating. With this purchase, dollar 5. is being donated to the Breast Cancer Research Foundation. Amazon Price: $109.99 $69.90 You save: $40.09 (36%) (as of April 26, 2019 10:14 am - Details) Product prices and availability are accurate as of the date/time indicated and are subject to change. Any price and availability information displayed on the Amazon site at the time of purchase will apply to the purchase of this product. Pressure canning is the only method recommended safe by the U.S. Department of Agriculture for low-acid foods. Doubles as a boiling water canner for preserving fruits, jams, jellies, pickles and salsa in pint and half pint jars. Also handy as a large capacity pressure cooker. Constructed of warp-resistant, heavy-gauge aluminum for fast, even heating. Works on regular and smooth-top ranges. Deluxe pressure dial gauge registers the complete range of processing pressures. This precise measurement is especially important at higher altitudes. Air vent/cover lock allows pressure to build up only when the cover is closed properly and prevents the cover from opening until pressure is safely reduced. Liquid capacity: 23 quarts (21.8 liters).